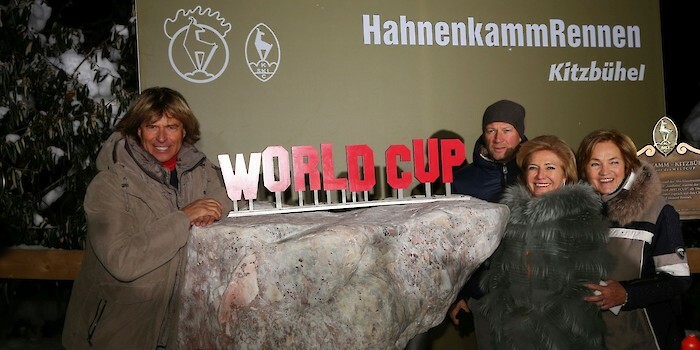 The opening ceremony of this years’ 76th Hahnenkamm-Races began with the unveiling of the “Stein des Anstoßes” World Cup memorial. Hansi Hinterseer revealed the stone together with Franz Pfurtscheller, who designed the memorial. The story behind the monument: in 1966, the French sports journalist, Serge Lang, first came up with the idea of an alpine skiing World Cup. At the Seidlalm in Kitzbühel, it was decided to put this idea into practice with the support of the French and USA team captains, Honoré Bonnet and Bob Beattie. To this day, the Seidlalm hut - located at the heart of the Streif - is seen as the birthplace of the sporting event that fascinates millions of viewers year after year. The “Stein des Anstoßes” is located in the Park of Legends, below the finishing area of the Streif, where it will remind ski fans of the 50th anniversary of the ”World Cup” success story for many years to come.